Sportech Racing and Digital is pleased to announce that it now connects yet another new European commingling customer to horse race betting pools available via Sportech’s Quantum™ Data and Operations Center in Europe. In March 2018, Sportech Racing and Digital entered into a new agreement with Norsk Rikstoto, the foundation that supervises pari-mutuel betting on horse racing in Norway. 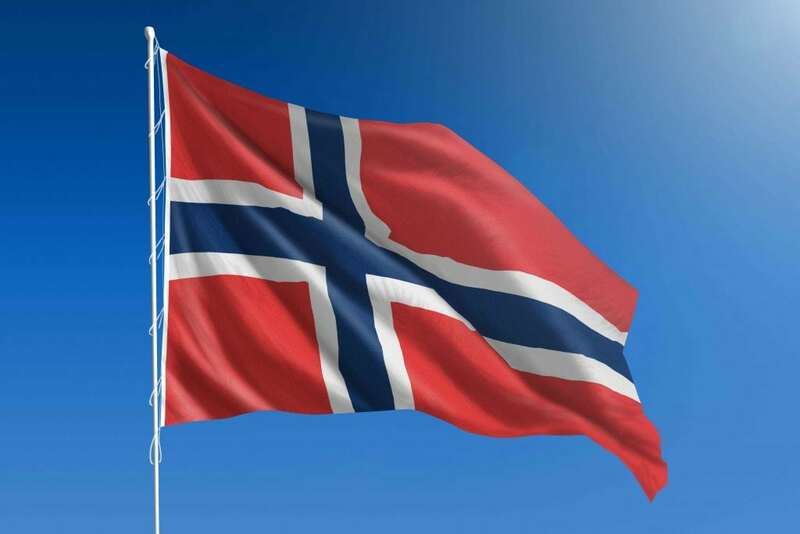 The agreement allows Norsk Rikstoto to use Sportech’s European Quantum™ Data Center systems and operational services to both offer their racing product to operators outside of Norway through commingling, and to commingle bets from their players into pools offered by racing operators from around the world. For more information about Sportech Racing and Digital, visit the Sportech Racing and Digital website. Sportech Racing and Digital, a division of Sportech PLC, (LSE: SPO), has been selected by Bensalem Racing Association, Inc. and Keystone Turf Club, Inc. to provide all new digital platforms for web and mobile betting on horse racing through Parx Racing®. The digital contract is part of a broader agreement to extend the contract to provide totalisator services to Parx Racing® at its Bensalem, PA race course and associated off-track betting locations. Parx Racing® has been a customer of Sportech Racing and Digital for decades, with Sportech providing its Quantum™ System pari-mutuel betting software, betting devices, and operational services. Under the terms of the new agreement, Parx Racing® will replace its existing advanced deposit wagering systems with Sportech’s G4 betting website platform and Digital Link® mobile betting app. Sportech’s G4 betting website platform is designed to provide an intuitive, immersive experience for betting online, with widgets for easy navigation and dashboard layout for dynamic information flow. Digital Link® mobile delivers a feature-rich betting experience for customers who prefer the convenience of betting on their own smartphone or tablet. Both the G4 and Digital Link® platforms are supported by marketing tools to help Parx Racing® effectively engage with their players. Live comedy events highlight an exciting entertainment calendar at Bobby V’s Restaurant & Sports Bar in Windsor Locks, Connecticut. Sportech Venues in partnership with Treehouse Comedy, a 35 year industry veteran, produce monthly events at the Northern Connecticut venue. Guests seeking a fun night out with friends have been treated to a variety of hilarious comedic performances from well-known comedians including: Gilbert Gottfried, Caroline Rhea, Lenny Clarke, and Judy Gold amongst many others. On Saturday, February 10 the comedy stylings of Nick DiPaolo were on display for guests who enjoyed drinking, dining and wagering all while laughing the night away. From HBO and Showtime Comedy Specials, “Comedy Central Roasts” and Sirius XM fame, DiPaolo left the sold-out crowd with a night they’ll never forget. For more information on Sportech Venues partnership with Treehouse Comedy at Bobby V’s, visit the Bobby V’s Windsor Locks website. 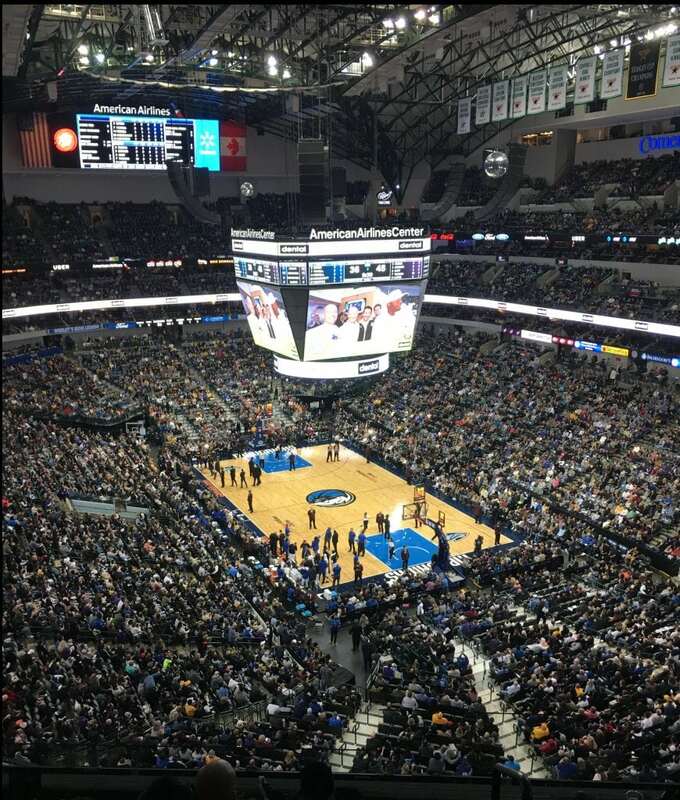 Sportech’s Bump 50:50 successfully introduced a new payment method for sales of the 50/50 raffles at Dallas Mavericks games. Fans are now able to use their debit card to participate in the 50/50 raffle, with half of the proceeds going to the raffle winner and half to the Dallas Mavericks Foundation. This is the first time that debit cards have been used to conduct 50/50 raffle sales in Texas. 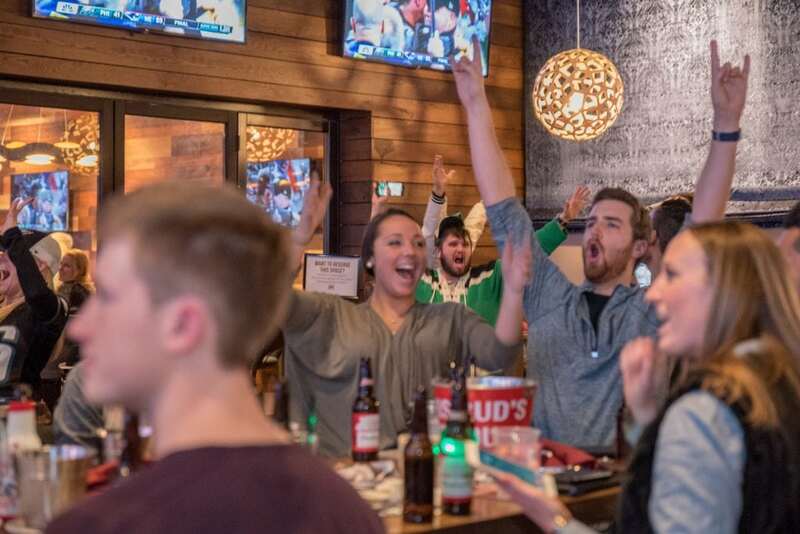 Last Sunday, Sportech Venues’ Bobby V’s Restaurant and Sports Bar in Stamford, Connecticut saw fans of Philadelphia and New England celebrating the big game, a scene set perfectly for an amazing game day experience for all. The capacity crowd was surrounded with over 200 HD TV’s showing the game as they enjoyed food from Bobby V’s scratch-made menus, signature drinks, and a hard-to-beat party atmosphere. Sportech’s Winners venue, located on the second floor of the facility, hosted guests whilst they enjoyed betting on and watching the day’s racing leading up to and throughout the big game. For more information on Sportech Venues and Bobby V’s, visit the Sportech Venues page or the Bobby V’s Stamford website. 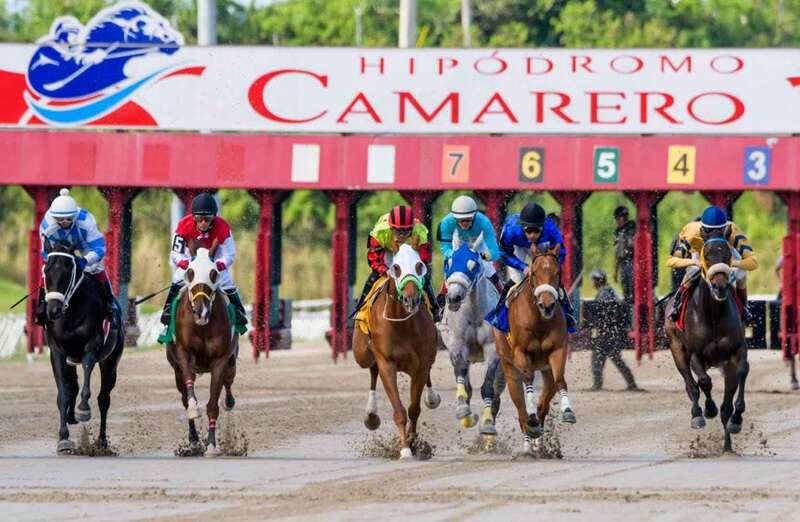 Sportech Racing and Digital now connects a new European commingling customer to horse race betting pools operated by Sportech’s long-time customer, Nicosia Race Club of Cyprus. In January 2018, OPAP, the holder of exclusive rights to numerical lotteries and sports betting in Greece, began commingling into Nicosia Race Club’s pools via Sportech’s Quantum™ Data Center facility in Europe. This new commingling arrangement brings the excitement of Nicosia’s racing to the 1,500 off-track betting outlets operated by OPAP. In addition, it also opens the gate for OPAP to now access all of the racing content made available through Sportech’s global pari-mutuel systems and adds yet another European country to Sportech Racing and Digital’s global footprint. For more information about Sportech Racing and Digital, and the services available through its Quantum™ Data Centers, visit the Sportech Racing and Digital website. Sportech Racing and Digital has successfully launched self-service and mobile betting technologies at two of the UK’s most prestigious racing venues, Ascot Racecourse and Chelmsford City Racecourse. Following the successful soft launch of the Digital Link™ mobile app and the BetJet® SL 2.5 self-service terminal, Sportech Racing and Digital customer Betfred Totepool have further extended these mobile and self-service technologies to the Chelmsford City Racecourse. Guests of the racecourses can use the self-service BetJet® SL 2.5 terminal to place tote bets or to fund their Digital Link™ mobile app for convenient, secure and private on-course pools betting. For more information about Sportech Racing and Digital, and the Digital Link™ and BetJet® SL 2.5 products, visit the Sportech Racing and Digital website. 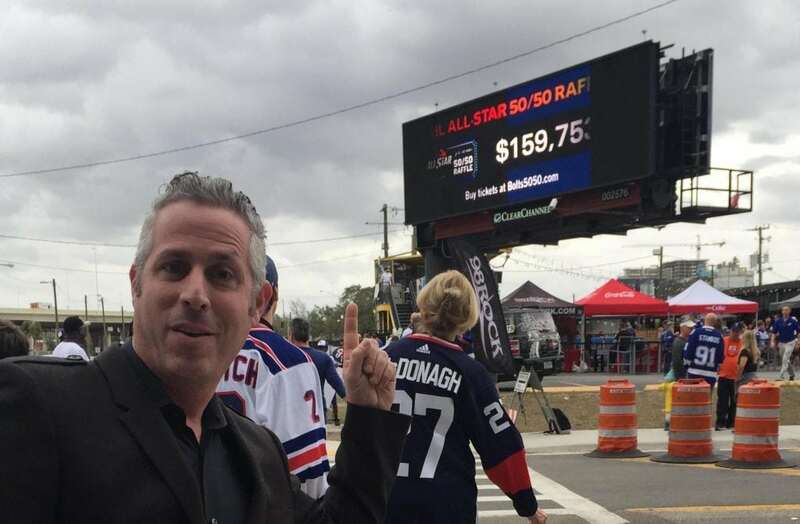 On Monday night the Tampa Bay Lightning held the biggest online 50:50 raffle for a sporting event in US history during the NHL All-Stars. 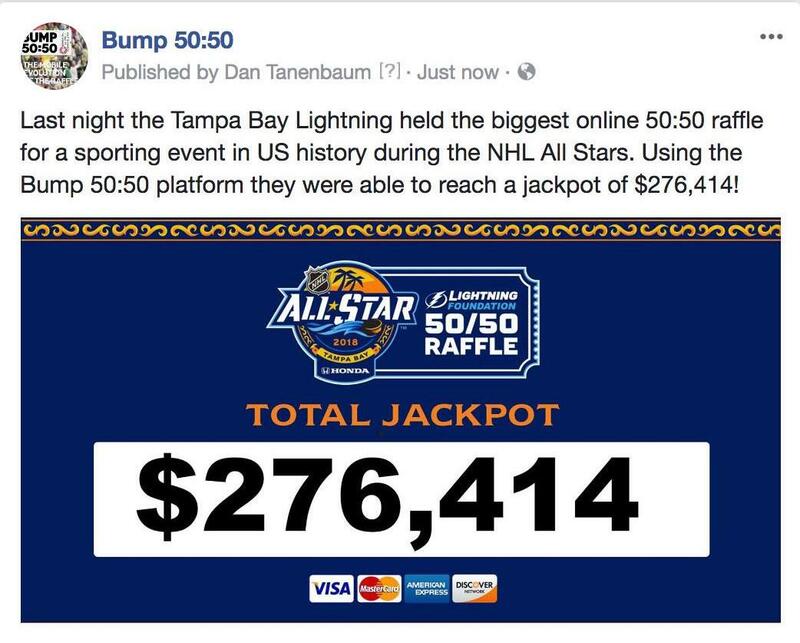 Using the Bump 50:50 platform they were able to reach a jackpot of $276,414! January 31, 2018 Sportech PLC News Comments Off on Bolts 50:50 Raffle Hits $160K!